Welcome to my website! Take a bite outta my blog! So, if anyone likes stirfry raise your hand. Ok, well now that we know you like it I can educate you on the soy sauce you have just dumped into it. Not good. Too much sodium and just all around not good for you. This is where Liquid Aminos comes in to play. Replace your soy sauce with this lil 8th world wonder. You need about half of what you would for the soy sauce you just tainted your lovely food with. So, a tablespoon of this onto your vegetables will for sure make them come alive. It's tasty and not to mention it is healther for you. I am gonna warn you though if you get overvelous with this product you will be puckering your lips. Again, a lil pinch there will do the trick. Think modesty. If you are anything like me, you like to eat. Sometimes I feel guilty about my choices, especially my snacks. I have come across a couple of websites that rant and rave about everything being homemade and only have certain amounts of ingredients (that you can read and understand). I think there is some truth in that. If you truly are what you eat, then I don't want to be "Maltodextrin" or "yellow #6." See below what ingredients are in this healthy snack. I really don't have time to be cooking every single meal I eat, so this lil bag helps me when I am in between my meals. I put a tiny spoon in the bag (resealable) and allow myself a certain amount of scoops. They have several kinds of Bear Naked products available. They also have really cool recipies on their website. (click the word Bear to be directed to their website above). Also, another good website to go to if you are wanting to get some information about read food is : http://www.100daysofrealfood.com/ The gal who blog's on that page is simply genious. I do however see some issues with "real food" being that we live in a colder climate. Read her information though. It's worth it. She has several links to other peoples sites and recipies. So, in a nutshell this product will help you curb your cravings until you get time to have your main dish. It's healthy and tastes yummy. I also want to note where I got it...Walmart. Best soup you will have...at a grocery store. Wow, how many of you like potato chips? C'mon...you in the back...yeah you...raise your hand. I know you like 'em. Guilty pleasures. This little doozie is crunch-tastic! I just went to a local Subway and had a meal. 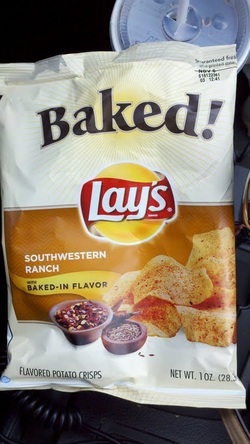 I picked up the healthier option for potato chips called "Baked Lays Southwestern Ranch." Now, if you are a flavor fan then you will like these. If you don't like things to have a little kick in them then try out a different kind. Right now, I am wishing I had the bag so I could read you the label of nutrients so you are just gonna have to believe me that they are ok for you. I think these would be good crunched and shoved into a hamburger too. Who doesn't like a burger with a crunch? Of course this randoom burger I talk about would have to be either a veggie burger or turkey burger. This girl is on a healhthy kick. Pick these up when you are at your grocery store or your local Subway. I guarantee you won't be dissapointed and you won't have to sacrifice your belly for it. Just don't go out and buy a bunch and eat them all in one sitting, I think you will regret that. Later tater tots! - B.